There's often a lot of confusion surrounding these terms. Notice that the margin of error calculation actually includes a Z score. Moreover, the Z score is determined by the alpha (α) selected by the researcher. So while we're used to seeing the margin of error reported, it would be more accurate to also report the alpha selected by the researcher. Remember, the α determines the risk of being right/wrong and is selected by the researcher. You could still obtain a margin of error with a risk of being wrong 98% of the time! Again, that's one of the reasons why it's important to report the α. An alpha value is a number 0≤α≤1 such that P(z≥z(observed) )≤α. 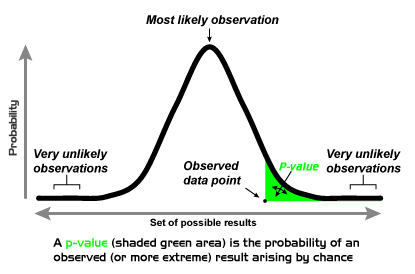 So you could think if it as the α is the specific score while the p-value is the probability or area under the curve.